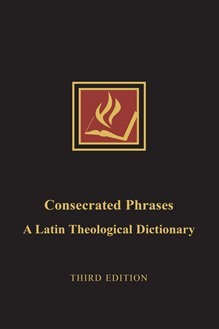 Consecrated Phrases has been a standard and valued reference work for theology students for many years. This new third edition is expanded by more than fifty percent from the previous edition. It includes many new entries, while entries from earlier editions have been expanded and extensively cross-referenced. The resulting volume functions better as a reliable guide to translation and a primer on the tradition out of which the consecrated phrases arose. The third edition contains many entries from canon and civil law, as well as terms from philosophy and theology. While Latin has often been called a "dead language," Consecrated Phrases demonstrates convincingly that the tradition continues not just to live but to thrive. This book will aid generations of students yet to come in understanding, appropriating, and developing the best of that tradition. James T. Bretzke, SJ, is professor of moral theology at Boston College. He is the author of A Morally Complex World: Engaging Contemporary Moral Theology (Liturgical Press, 2004).